Attention Cat Lovers! This Is Weekend Cat Blogging #41! See fun feline photos & discover yummy new food blogs. Visit my pal Clare & her crazy Cat Kiri at Eat Stuff in Australia for all the links to this week's kitties. We'd love to have you join us. Just leave your permalink in a comment at Eat Stuff. For even more pussycat pics, be sure to catch the traveling Carnival Of The Cats each Sunday night. And the weekly Friday Ark features everything from cats to Carolina Parakeets. J2 has the right idea; if we had sunshine here today, I'd be sitting in it! A little warmth is still hard to come by this time of year in your part of the world. J2 has the smarts to know comfort when he sees it. I used to have a little email that had a "Cat's Rules of the house." Now, I think you have one inside/outside cat -- doodle bug.. I can bet she has at least one of the rules that was listed on it.. I will find it and share it later. And one of the outside cat rules here is "Sleep on mom's warm car hood after she returns from errands." That looks like a great spot. Cats are heat seeking missiles. That's a visual definition of contentment. I have a soft spot for orange and white fluffcats. River was out today rolling around on the warm spots; first warm, sunny day in quite some time. 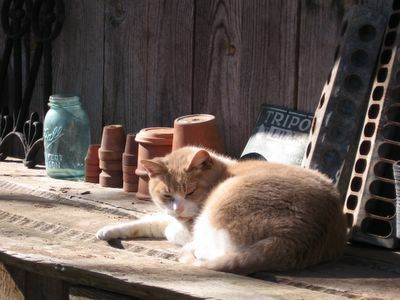 J2 is enjoying himself and yes, we go where the warmth is even though it's the cat hood or potting bench. What a beautiful photo. Thanks for sharing it with us!